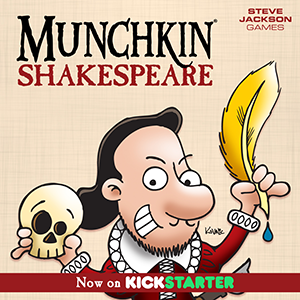 Daily Illuminator: Munchkin Shakespeare Is Live (And Funded)! February 8, 2017: Munchkin Shakespeare Is Live (And Funded)! The curtain has lifted – Munchkin Shakespeare has taken the Kickstarter stage, and you have a front-row ticket! Designed in part by the fans, Munchkin Shakespeare brings the works of the Bard to life . . . with classic Munchkin humor, of course. (Which is to say: we bite our thumb at the classics, if you catch our drift.) And this play has opened to rave reviews; Munchkin Shakespeare funded in under five hours, and has already unlocked stretch goals! Why Kickstarter, you may ask? Well, Andrew answered that in his last Daily Illuminator, but in short: since we crowdsourced a lot of the ideas, we thought crowdfunding would be a fun way to create the project and see just how big it could get. Munchkin Shakespeare started as 112 cards in a tuckbox, but by meeting stretch goals, is already growing to be a much larger set in a full-sized Munchkin-style box. (Ed. note: And we're there.) And there are many ways you backers can help the game grow! Not only can you get a base game, you can back the Kickstarter Exclusive Expansion, with even more cards, including a host of Dungeons, and other trinkets – the more funding we get, the more cool stuff we can pack into the box! We also have a Munchkin Shakespeare Demo Pack, to help recruit new actors to this zany play we call Munchkin. In addition, one of the most highly requested items is making a rare return appearance: Munchkin Blank Cards. These customizable cards put you in the director's chair! Plus, if you back within the first 24 hours, you'll get two copies of a Kickstarter-exclusive bookmark! That's a lot of Shakespearean stuff. And there's even more on the way, depending on how much support this set gets. Follow the project to stay up-to-date with its progress and our updates, and (of course) here on the Daily Illuminator. We'll also be sharing fun stuff like preview art on our social media accounts, so follow us there as well!